Featured Today is One, Light to Moderately Used & Somewhat Rare, M en's V ery Desirable Victorinox Swiss Army AIRBOSS MACH 1 Official Swiss Air Force Wristwatch (1st generation) with Gorgeous Jet Black Dial, Sapphire Crystal (never scratches) and Stainless Steel Link Bracelet From the Ever Popular and Partially Discontinued Professional High End Collection. NOW YOU CAN BE THE AIRBOSS TOO!! This highly coveted classic is apx 16 years young and was enjoyed in gentle moderation during this time frame yet can still be considered in overall good to very good shape for it's age. Close examination with 2 straining naked eyes reveals a perfect sapphire crystal. Bezel & case look good with minor scattered scuffing. Caseback in decent shape with minor scuffing & a few surface scratches present. Bracelet w/hidden push button deployment clasp & safety latch all have light to moderate scratches, more so to the outer wrist half of bracelet. None of the reported wear is considered significant or worth losing precious sleep over. 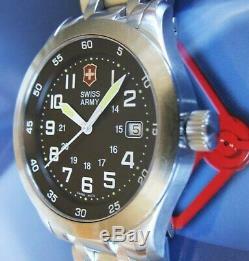 Remember, this is a high quality watch and was one of Swiss Army's best at the time of production. These old school models are a rare find in any condition and highly sought in the marketplace. The new owner can expect countless years of dependable service and look pretty darn stylish as well. 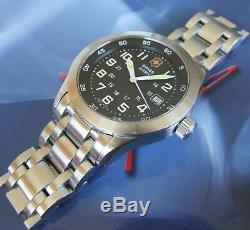 This would make the ideal watch for work, play, adventure or just add to your collection to proudly display. Please review numerous hi-res pic's under magnification and consider as part of description. If I failed to verbally mention something but you notice in pic's then you can consider it as described as the pic's speak for themselves. 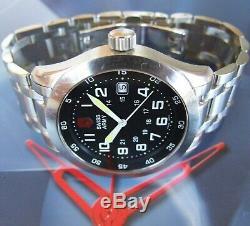 Watch has been professionally serviced & cleaned so you won't find any dirt or grime from past usages. Pic's do not do full justice. Watch looks much better in person & on wrist! Recently fitted with a fresh Energizer battery and keeping proper time. Triple Coated Anti-Glare Polished Scratch Proof Sapphire Crystal. Super Luminova Hands & Hour Markers. Attractive Black Dial, EZ Read Bold White Numerals. Brushed Stainless Steel Bezel & Case & Screw-Down Caseback. 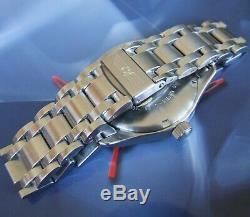 Brushed SS Bracelet w/Push Button Deployment Clasp & Safety Latch. Some specifics : Watch measures just over 1 9/16 or 40 mm across case excluding crown & lugs. Width between the lugs is 21 mm. Bracelet is currently sized for an apx 8 wrist circumference (or smaller). Individual links can easily be removed for any downsizing. 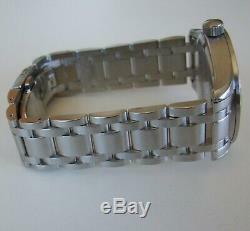 Any 21 mm replacement leather or rubber strap would also work. 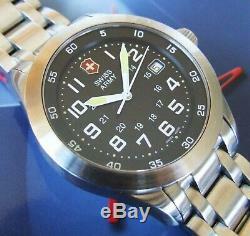 Included is the awesome classic watch only (as seen in pic's). 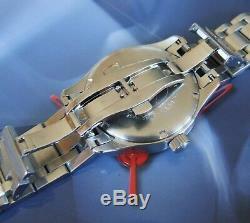 No box, extra links or manual but watch is super EZ to operate. The utmost care will be taken to package securely so it arrives safely. 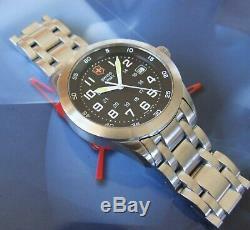 The watch pictured is the actual watch you will receive and comes from a. No extra wait times here. This is a relatively expensive watch. 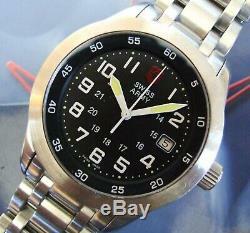 Please confirm through the Swiss Army website on AIRBOSS discontinued models as they appear to have revamped the Airboss line with several new styles. Rest assured, the new owner should be very happy with this genuine old school 1st gen model. 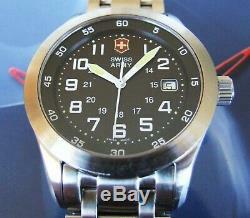 Please take a moment to view my other listings for more high quality Swiss Army & Tag Heuer watches as well as many other great products and thanks for looking. Pictures and text may NOT be duplicated in part or in whole. I routinely monitor the market and will not tolerate any theft of my IP. The item "VicTorinoX SWISS ARMYRaRe MeN AIRBOSS MACH 1 AiRFoRCeSapphire+SS BraceletNICE" is in sale since Thursday, April 4, 2019. 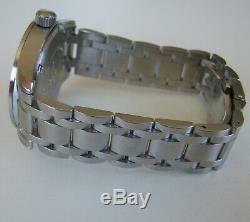 This item is in the category "Jewelry & Watches\Watches, Parts & Accessories\Wristwatches". 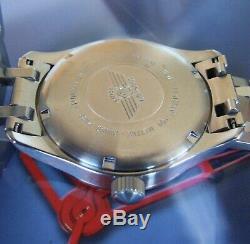 The seller is "realtagheuer" and is located in California. This item can be shipped to United States.